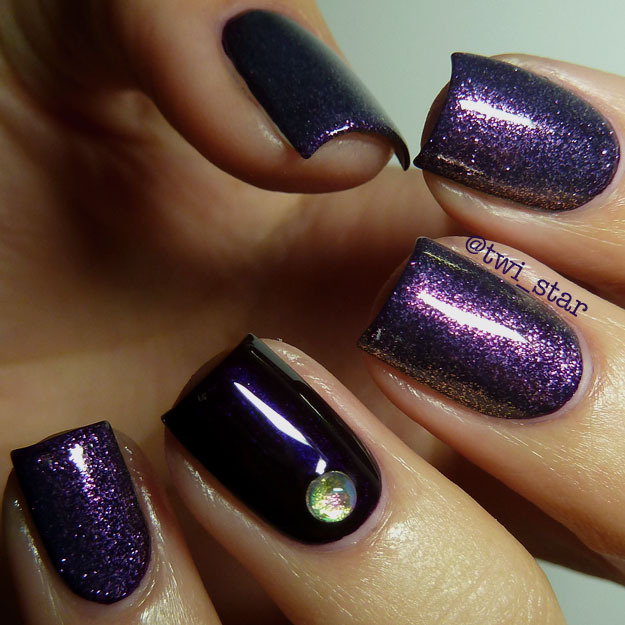 twi-star | Nail Art Blog: Julep Padma and Brooke - pretty purple polishes! Who wants to see some amazing pretty purple polishes, aka PPPs?! Alright then, calm down, here they come. I’ll wait until you shove your eyes back into your head. For my base I used Julep Padma, a vampy purple with some subtle shimmer. It does look like a crème in most light but when you move your hand you can catch some glimpses of a gorgeous deep glow. The formula was really nice on this one, it could be a one coater if you apply carefully. I used 2 coats on my ring and 1 coat as my base on all the others. Sadly, this color has been discontinued. I had been waiting patiently (probably a couple years) to get my hands on Julep Brooke, an ethereal purple flake topper. Finally, Julep held a sale where they offered some of their rare colors for insane prices, the catch was they only had a few of each since most had been discontinued. Somehow I was lucky enough to see the sale before it was advertised and snatched up a few of my ISOs! Brooke is everything I hoped she be! It’s a little thick, just a touch, but I find a lot of flakey topcoats to be like that, I think it’s just the way the particles are suspended in the base. But it applied nicely, this is 2 coats. I applied a 3mm opal jewel to my ring finger and as soon as I applied it I regretted it lol I don’t think it adds to the look of this mani but instead is just kind of blah. I hate when that happens! Even with the jewel I am still loving the way this turned out, it’s purple so I was definitely going to love it but something about Brooke just does it for me!